When someone says "the South," the Magnolia Midlands of Georgia comes to mind. Pulaski County, Georgia is located in the heart of the Midlands. "The South" is not specifically a southern location, but a frame of mind and a way of life. Gracious, elegant, and uncomplicated describes the southern way of living in Pulaski County. The citizenry of the county are very proud of their heritage and continue to instill today the values passed down by those generations who have gone before us. Those values, by the very nature of "southernism," include preservation of our heritage and pride in our family histories! Please use this site to assist you in searching for your ancestors and documenting your own family heritage." Pulaski County was created 13 December 1808 from what was then Laurens County. Georgia's 36th county was named for Polish Count Casimir Pulaski who died in Savannah of wounds suffered in the Revolutionary War. The Ocmulgee River runs through Pulaski County, and this area was the capital of the Creek Indian Confederacy. 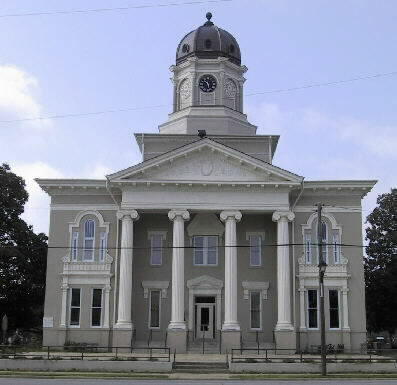 The county seat and only incorporated city in Pulaski County is Hawkinsville. The courthouse is shown below. Hawkinsville is home to one of the largest harness racing training facilities in the country. Many trainers 'winter' in Hawkinsville, and on a mild afternoon a ride to the track will yield the beautiful sight of a bevy of sukeys being pulled around the track by beautiful thoroughbred racers! As a part of the UsGenWeb and GaGenWeb project, we invite you to come on in, pull up a chair, and visit with us. Relax...have a cup of tea or a nice cool glass of lemonade...get comfortable, and start or continue your Pulaski County Research! This website is maintained on a volunteer basis in order to assist you in the search for your roots in Pulaski County, GA. If you have any questions or if you have any data you are willing to share with others....please contact Elgee Stephens , your Pulaski County Coordinator. FLOYD, Shadrick D. & Elizza Davis FURNEY, Willis E. & Francis Cornelia Davis HARRISON, Benjamin R. (b. 1849) JOINER, John J. KING, Henry (1796 - 1882) LASSETER, Wade Hampton (b. 1875) MORRIS, Hon. Robert G. NELSON, James F.
NOBLES, John Wesley & Fannie Davis POLLOCK Family Notes RAWLINS, John T. RILEY, Samuel A.
SHIPP, William W. (1814-1883) SIMMONS, Murdock Ben & Elizabeth Davis TAYLOR, Ezekiel H. TAYLOR, Simeon W.
Many of these cemetery listings are partial lists. If anyone has additional information from any of the cemeteries, you may use the contact email address to send the information. I am also interested in starting a tombstone pictorial for each cemetery. If you would like to assisst in this project, please contact me at the email listed. Please be patient if you encounter any errors while visiting...this site is currently undergoing reconstruction! A weekly newspaper since 1866. Have you considered donating your Pulaski County, GA genealogical and historical information to the GAGenWeb Project? Please do! You may send your records or submissions to me at Elgee Stephens , your Pulaski County Coordinator. to automatically create and send your ancestors' records to the GA USGenWeb Archives.